Northeast Travel, Travel in the U.S.
It’s amazing how time flies when you are having fun and our great American road trip is coming to an end. We said goodbye to my parents and the farm we called home for the week in Cooperstown and headed out in a light drizzle to our destination for the day: Pittsburgh. Neither my husband nor myself had ever visited “Steel City”, but we were excited to see as much as we could in less than 24 hours. 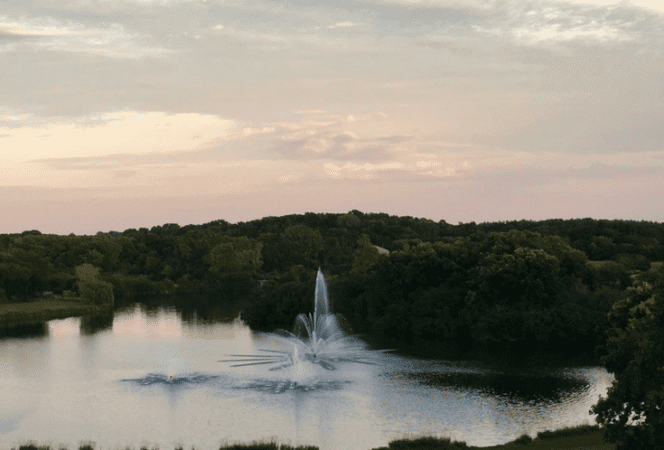 We set out just after 5 a.m. and our seven hour drive took us through the gorgeous wooded terrain of northern and central Pennsylvania, crossing multiple towering bridges, rain swollen creeks, and rivers. The drive was uneventful because the kids were using the car’s wi-fi of course (darn you, Chevy, LOL), and my husband and myself split the drive time completing work when not driving. We were horrible company for one another. About an hour before arrival the kids started asking for food, so we promised them our first stop in Pittsburgh would be for lunch. As we drove into Pittsburgh, we were pleasantly surprised. I think we both expected an industrial, run down city, but Pittsburgh was far from that. It is made up of rolling hills and valleys, crisscrossed by rivers and bridges. It’s enough to confuse a novice driver, (yes, we got lost, as did our GPS), but that allowed us to see more of this beautiful city. We stopped at a highly recommended restaurant called Pamela’s Diner, but we were unimpressed. Four of us had the famous crepe hotcakes (maybe that was our mistake), and we all thought they were cold and nothing special. My husband had an egg dish which he thought was decent. He was kind enough to let me sample his potatoes, and I will say, those were pretty good. After we were semi-fed, we headed down the street to the Carnegie Museum of Natural History. 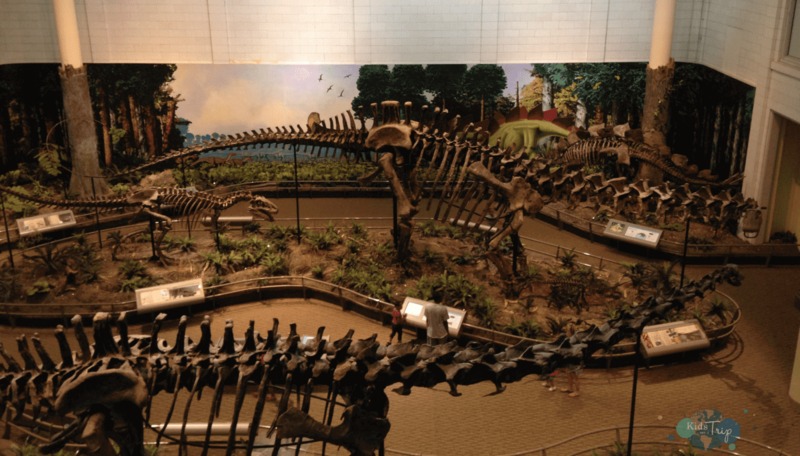 The museum is located on the east side of Pittsburgh near Carnegie Mellon University and the University of Pittsburgh. (We told our 12 year old to consider these his first two college visits, and figure we are saving ourselves some money that way, lol). Admission also includes access to the adjoining Carnegie Museum of Art. The kids were not thrilled that we were “dragging them to another museum” because all they wanted to do was swim at the hotel pool. That was about to change. We entered the Hall of Geology and they were only mildly interested, but as we continued further into the room, we found the Hillman Hall of Mineral and Gems. I have never seen a larger collection of gems and minerals in a museum before, and we were all blown away. 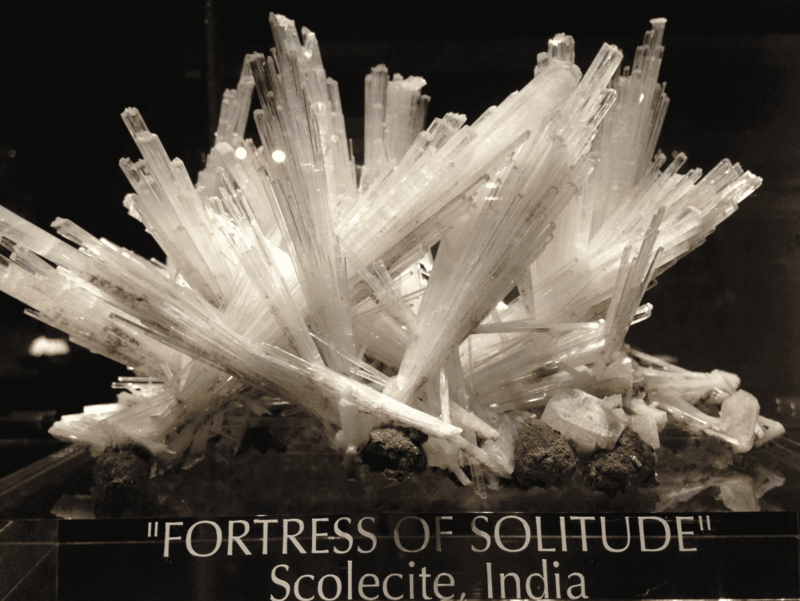 There was an area of minerals with unique names like the “Fortress of Solitude”, but there was also an area explaining the mining process, exhibits showing locations in the world where mining occurs, and brilliant collections from around the world. We loved it so much we walked through it twice! After that we continued to the Dinosaurs in Their Time exhibit. If your kids love dinosaurs, this is the museum for them! As it turns out, this is the first exhibit in the world to feature scientifically accurate, immersive environments from the Age of the Dinosaurs arranged chronologically with actual dinosaur fossils. Even cooler is that fact that nearly 75% of the dinosaurs on exhibit are made up of actual fossils. It is hands down the best dinosaur collection our family has ever seen! Next, we headed upstairs and ended up in the Bird Hallway. I don’t know why, but my kids really enjoyed seeing the variety of stuffed birds, from owls to roadrunners, toucans to hawks, the kids admired each and every one of them. When I told them they were real birds, they didn’t believe me. Oh well, I guess there’s no harm in letting them believe they’re fakes. The last area we spent a lot of time exploring was the Polar World and Hall of American Indians. The Polar World exhibit focused on the life of the Canadian Inuit in North America. It touched on their history, settlement, culture, and life today and featured some cool artifacts like a life sized polar bear and model igloo for the kids to explore. 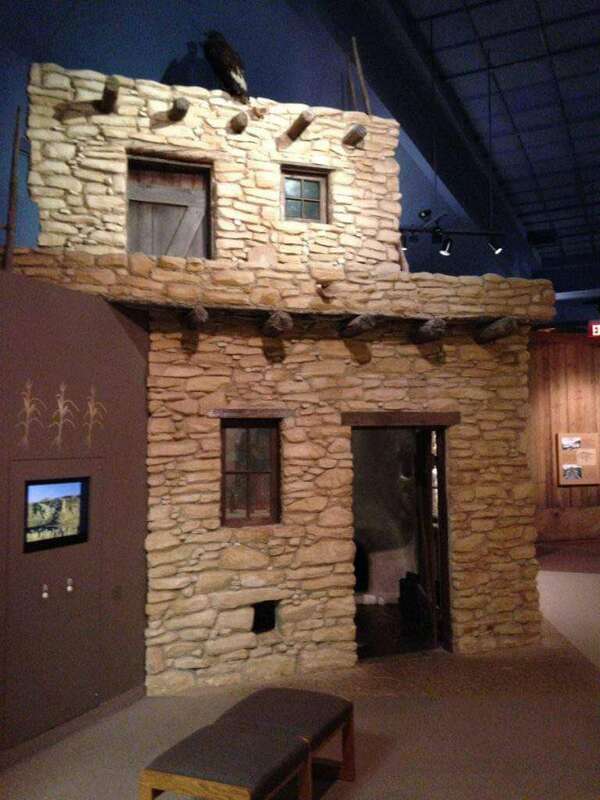 The Hall of American Indians focused on a handful of tribes from various locations throughout the United States detailing their history, art work, and traditions. I found it fascinating, but the kids didn’t spend as much time as I would have liked learning about their Native American ancestors. love Egyptian mythology (thank you Rick Riordan for your Red Pyramid series) and they enjoyed the hall of Egyptian gods in this area. Realizing it was much later than we had anticipated, we quickly wrapped things up and headed down the road to the Cathedral of Learning. 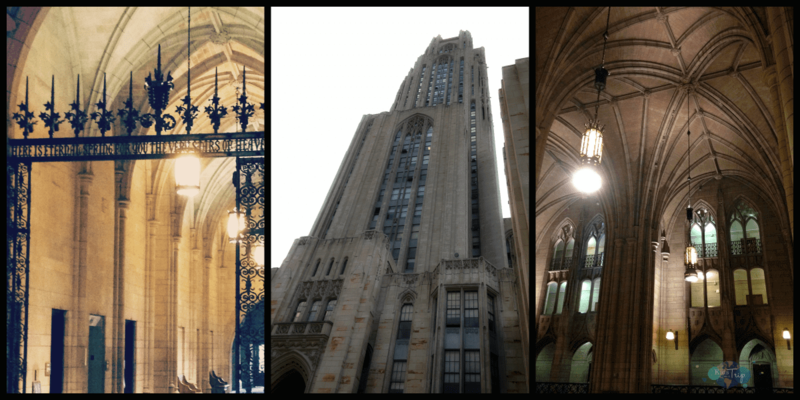 This gothic tower and its Nationality Rooms on the University of Pittsburgh campus are one of the most visited attractions in the city. Unfortunately, I only had a few minutes to run in to the first floor and take a few pictures as the kids were getting restless, but I would definitely want to go back and take a tour to see the rooms. The next stop was our hotel, the Hampton Inn & Suites Downtown. The hotel has a central location in the Strip District, across the street from the Heinz History Center (which we will tour on our next visit) and walking distance to plenty of restaurants as well as PNC Park and Heinz Field. Thankfully, the hotel has free parking (unheard of in most major cities), a swimming pool (hooray), free breakfast (another plus), and a very spacious room for our family of five. Once we convinced the kids to forego swimming for dinner, we headed off to Sienna Mercato based on the recommendation of the concierge. (If you want to know more about the hotel, you can see our review on TravelingMoms.com). 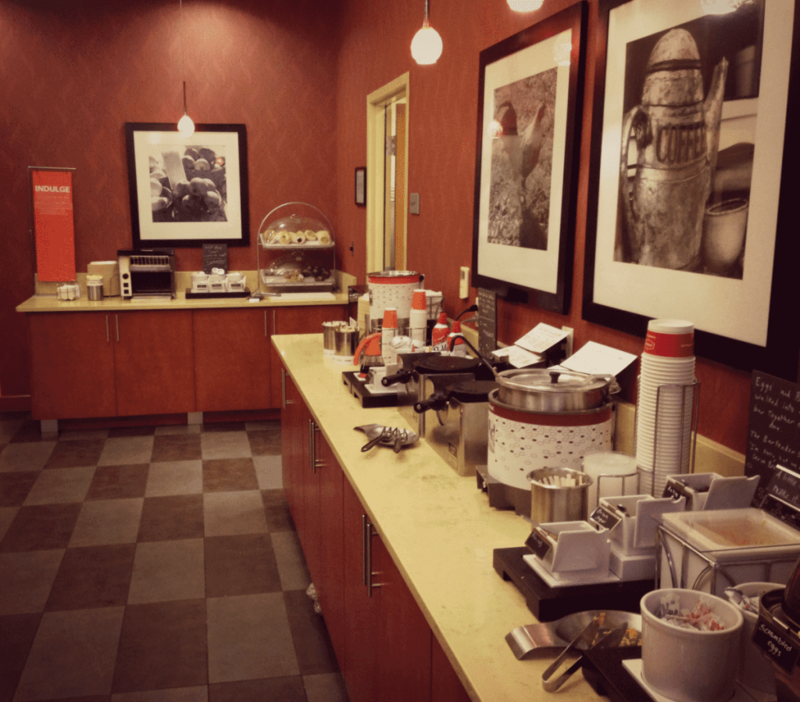 What family doesn’t love a hotel with a breakfast bar? Sienna Mercato on Penn Avenue is three restaurants within one building. The place was packed, and we incorrectly assumed that the food available on one floor would be available on the others. This is not the case. Be sure to check in for the correct restaurant. First floor is meatball themed (the Emporio). The second floor (Mezzo) is pizza, pasta, and panini. The third floor (Il Tetto) is a roof top bar and there was a line to get up there the entire time we were dining. We checked in at the Emporio and they took our cell phone number so they could call us when a table was ready. This allowed us to walk around and explore Pittsburgh while we were waiting. Along Penn Avenue there are a ton of restaurants, shops, and a theater district. We also noticed we were very close to PNC Park and the Pirates happened to have a game that evening (you know where this is headed). Check another ballpark off the list. 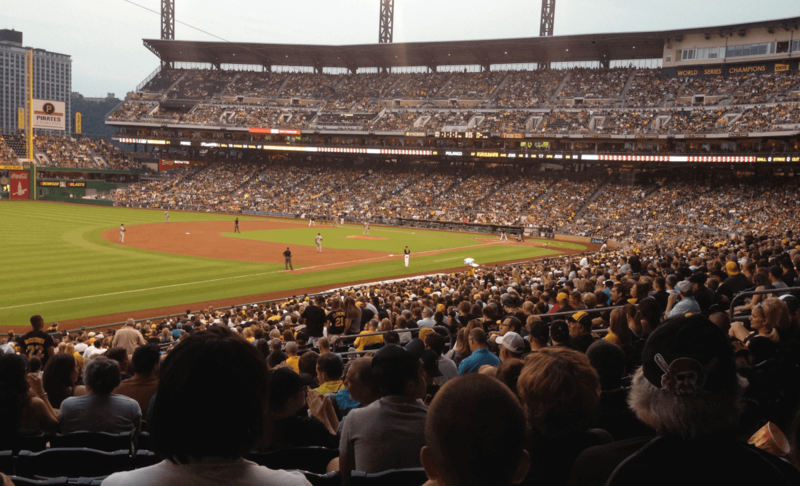 Dinner was delicious and during the meal my husband and oldest decided they would try and head over to PNC Park to see if they could find tickets to the game. After dinner we parted ways, and once they were out of sight, I took the other two to Ben & Jerry’s for an after dinner snack. They were bummed about missing the baseball game, but I think the ice cream made up for it. 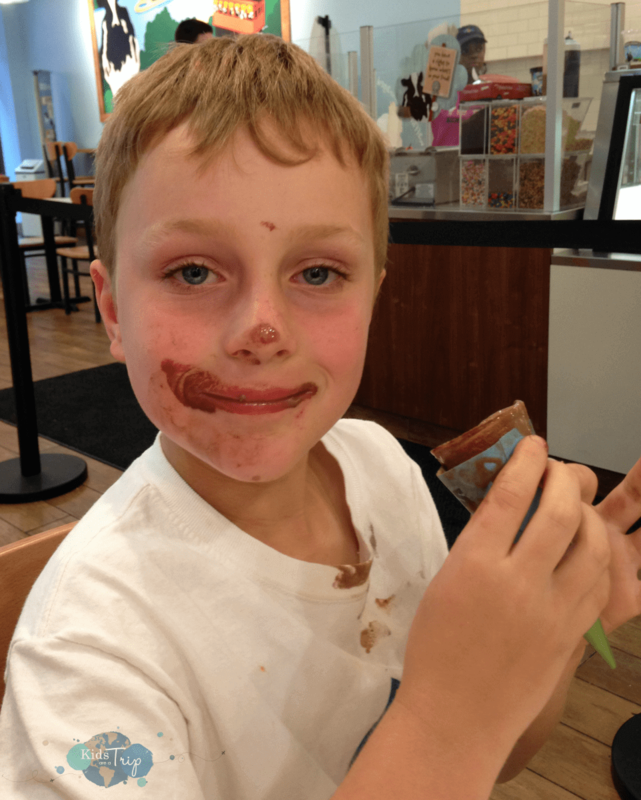 Ice cream makes everything better. We headed back to the hotel, the kids swam, and went to bed. 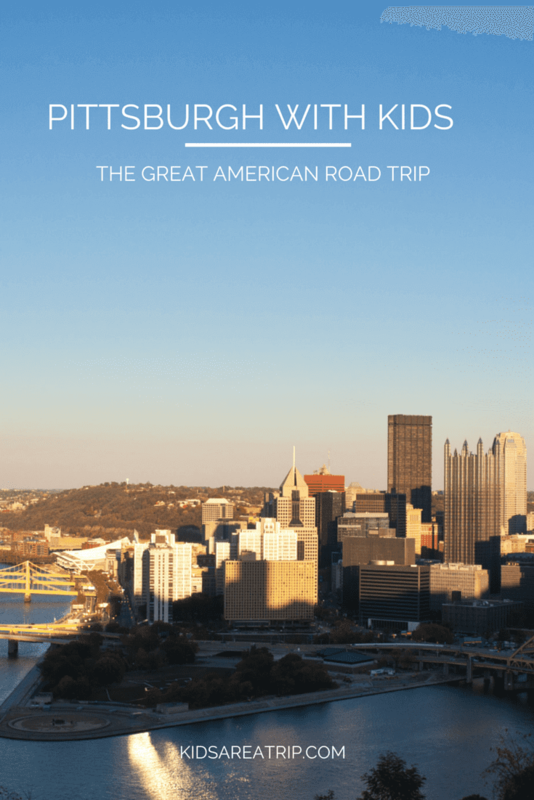 Unfortunately, we did not get to see 75% of what I wanted to see in Pittsburgh (other sights on my list were the Duquesne Incline, Carnegie Science Center, and the Pittsburgh Zoo & PPG Aquarium), which means we will definitely schedule a return trip. This concludes our great American road trip (because frankly the trip from Pittsburgh to Chicago was uneventful except for the torrential downpour in Ohio that lasted for two hours), so thank you for following along. I hope you have enjoyed learning about Cleveland and Cooperstown, and the road in between. It has been a wonderful journey and now we are ready to be home. Have you visited Pittsburgh? 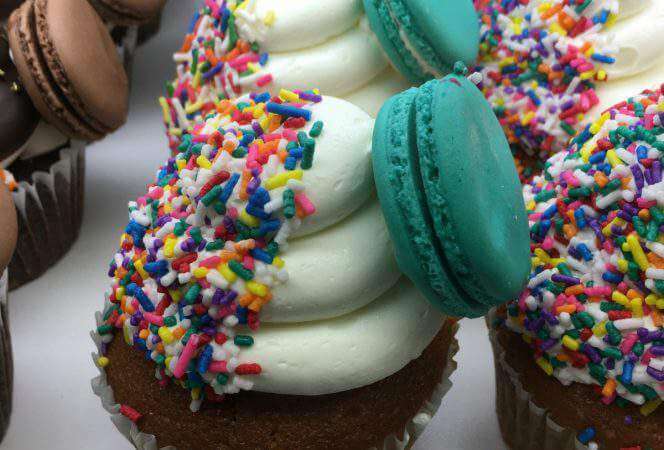 What’s your favorite thing to see or do in the city? 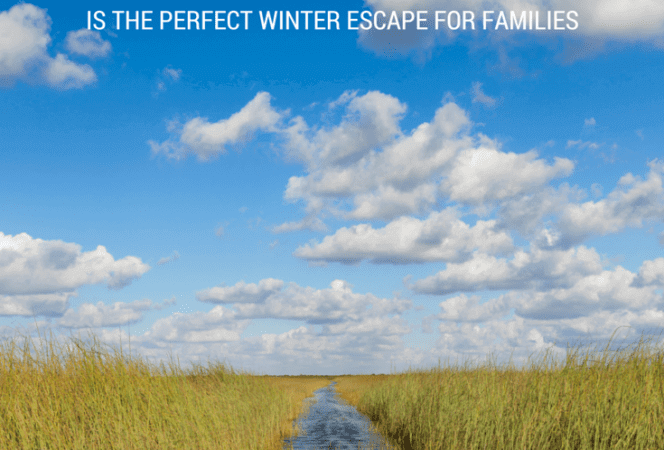 · Northeast Travel, Travel in the U.S.